Grease a 9-inch pie dish very well and preheat the oven to 350 F.
In a food processor, add 2 cups pecans and process until the mixture starts to clump and oils start to release (about 35 secs), but don’t make pecan butter. Melt coconut oil or butter with brown rice syrup in small saucepan. Transfer pecan mixture into a large bowl and mix with the rest of the ingredients. Using your hands, squeeze the dough over and over to combine very well. You should be able to form a ball with it. If it’s too dry, add a bit more oil. Spoon the pecan dough onto pie dish and press out evenly. Press down firmly with fingers to form a crust, bringing it up along the sides. Prick base with fork 12-13 times. Prebake- at 350F for 9-12 minutes. Remove and cool for 10 mins. 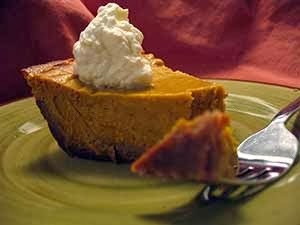 In large bowl, whisk together the maple syrup, molasses, and arrowroot powder or egg yolks. Then add remaining ingredients and whisk together, adjusting spices to taste, Add more sweetener if desired. Scoop the filling into crust and smooth. Cover the edges of the crust with tin foil or a crust shield and bake for 50-55 minutes at 350F. Place on cooling rack for 1 hour. Transfer to fridge to set for a minimum of 3 hours or overnight. Coconut Whipped Cream: Refrigerate 2 cans of coconut cream for at least 4 hours. Open can upside down and drain the coconut water for later use in a shake or just drink. Whip 2 cups of the remaining coconut cream in a well chilled bowl with well chilled beaters until stiff. Add 2 Tbsp sucanat or raw cane sugar and 1 tsp vanilla extract, if desired.